Through the use of civilian security coordinators in settlements and outposts, the IDF has, essentially, privatized law enforcement in the West Bank. A further aspect of this symbiotic relationship is the army’s use of the coordinators to promote de facto recognition of unauthorized settler outposts. Our first post about our report “The Lawless Zone” focused on the unclear relationship through which Israel effectively privatizes powers in the field of defense, law enforcement and policing, and transfers these to Israeli settlers. The security coordinators are residents of West Bank settlements who receive quasi-military powers. Although they are not formally empowered to issue commands to soldiers, in practice they do so, and in many cases they exploit their powers in order to expand their settlements’ territory. This is the main problem created by the institution of the security coordinators, and accordingly our key recommendation is that the army should reassume these powers and appoint security coordinators who are officers in the permanent army and are accountable solely to the army and not to the settlements. There is another problem, however, one that highlights the symbiotic relationship between the army and the settlers. In the mid-1990s, the Israeli government decided not to establish new settlements unless they were approved by the entire government. Since then the phenomenon of the “outposts” has developed. An outpost is the result of the seizure of land that is ostensibly private and unauthorized, but enjoys the de facto support of the authorities, including generous support from government sources. This tool is used by settlers to seize Palestinian or public land. This process was described in extensive detail both in a report prepared by Attorney Talia Sasson and in the Yesh Din report “The Road to Dispossession.” In recent years the emphasis has been on expanding and approving existing outposts, rather than on establishing new ones. None of this could have happened without extensive assistance from the army. In one instance, the outpost of Netzach Binyamin was torched by Palestinians. The army did not provide protection and so the Israeli civilians fled. In a case involving the land seizure orders in Dura al-Qara, the army concealed the existence of the orders from the Palestinian residents to prevent them appealing, exposing a long-standing pattern of collaboration between the army and the settlers. Our latest report has identified a new dimension to this collaboration. In 2009 the district brigades redefined the guarding areas for which the security coordinators are responsible. The changes were made after many years in which the coordinators effectively worked without any geographical restriction, since the guard order defining their operations did not specify the boundaries of the settlements. Following a petition submitted by the Association for Civil Rights in Israel, the army took no less than four years to prepare the amendment. The amendment led to two changes. Firstly, the guarding area of the settlement was defined not according to its municipal boundaries, but according to the defense perception of the brigade commander. More importantly, for the first time the orders defined guarding areas for illegal outposts: 48 such outposts were allocated independent guarding areas, while 35 more were included in the guarding area of their parent settlement. This provision constitutes the de facto approval of the outposts by the IDF – and this in an administrative process that was supposed to restrict the security coordinators’ operations. This process happened quietly, without a government decision, without public discussion and without updating the courts, which are still hearing the issue. An ostensibly technical military order bypassed all these stages, granting official recognition to a criminal offense. This post is presented as a public service, in case you still believe in the fairytale about the wild settler and the army that does not pick and choose its operations. The army very much picks and chooses its operations; it has always done so. Read the full Yesh Din report here. Tuwani – On September 20, the South Hebron Hills Popular Committee (SHHPC) have organized a nonviolent action to claim the Palestinians right to access to the land and to denounce the illegal settlers expansion, near the Palestinian village of Susiya. One week ago the Israeli settlers illegally built a tent (about 20 s.m.) on Palestinian land, situated between the Palestinian village of Susiya and the Israeli Suseya settlement, where the settlers used to gather every afternoon. Beside this tent there is a well owned by a Palestinian from Susiya in which the settlers used to swim. This violations prevented the Palestinian shepherds and villagers to use the well and to graze in the valley close to the place. On Saturday morning, at 10 a.m. several Palestinian men, women and children, with the solidarity of Israeli activists went to the tent and dismantled it. Subsequently they collected the garbage around the well and they took water from it as a demonstrative action. Suddenly around ten settlers came out from Suseya and some of them crossed an area in which the access is forbidden to Israelis and raged against the nonviolent activists. 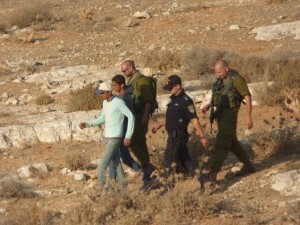 In the meanwhile Israeli Forces arrived and the Palestinians denounced the settlers violations. At 10:45 the Israeli army and Border Police declared the area a “close military zone” for one day, in order to push away the Palestinians and the Israeli activists. Yet the settlers remained inside the temporary close military area with the Police and army. 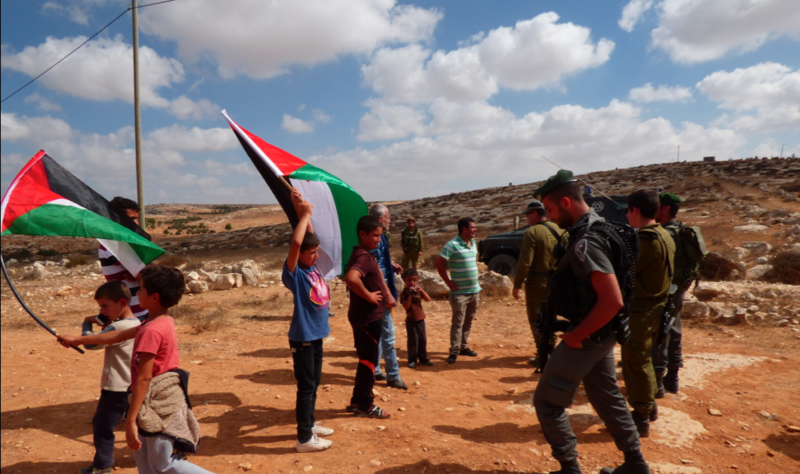 The nonviolent action aimed to prevent the settlement illegal territorial expansion and to stop the ongoing appropriation of Palestinian land from the settlers present in the South Hebron Hills are. At Tuwani – Il 20 settembre, il Comitato Popolare delle colline a sud di Hebron ha organizzato un’azione nonviolenta per affermare il diritto dei Palestinesi di accesso alla terra e per denunciare l’illegale espansione dei coloni, vicino al villaggio palestinese di Susiya. Una settimana prima i coloni Israeliani hanno illegalmente costruito una tenda (di circa 20 mq) su terra di proprietà palestinese, situata tra il villaggio Palestinese di Susiya e l’insediamento Israeliano di Suseya, dove i coloni usano riunirsi tutti i pomeriggi. A fianco alla tenda c’è un posso di proprietà di un palestinese di Susiya, nel quale i coloni fanno il bagno. Queste violazioni impediscono ai pastori e gli abitanti palestinesi di usare il pozzo e di pascolare nella valle vicina. Il sabato mattina alle 10:00 molti palestinesi (uomini, donne e bambini) con la solidarietà degli attivisti israeliani sono andati alla tenda e l’hanno smantellata. Successivamente hanno raccolto i rifiuti intorno al pozzo e, come azione dimostrativa, hanno utilizzato l’acqua. Improvvisamente circa dieci coloni sono venuti dall’insediamento di Suseya e alcuni di loro hanno attraversato un’area in cui l’accesso è vietato agli israeliani e si sono infuriati contro gli attivisti nonviolenti. Nel frattempo sono arrivate le forze armate israeliane e i palestinesi hanno denunciato le violazioni dei coloni. Alle 10:45 l’esercito israeliano e la polizia hanno dichiarato la zona un area militare chiusa per un giorno, al fine di scacciare i palestinesi e gli attivisti israeliani. Eppure i coloni sono rimasti dentro la temporanea area militare chiusa con la polizia e l’esercito. L’azione nonviolenta ha lo scopo di impedire l’illegale espansione territoriale della colonia e di fermare la continua appropriazione di terra palestinesi da parte dei coloni israeliani nelle colline a sud di Hebron. At Tuwani – On September 17, at 5:30 a.m. three cars with fourteen Israeli settlers came into the Palestinian village of At Tuwani, escorted by two army jeep. The settlers entered in the archeological site located between several Palestinian homes, in the middle of the village, one of them was armed. At Tuwani inhabitants started to gather at the closest Palestinian home and the owner of the house demanded to the Israeli army explanations about the happening. 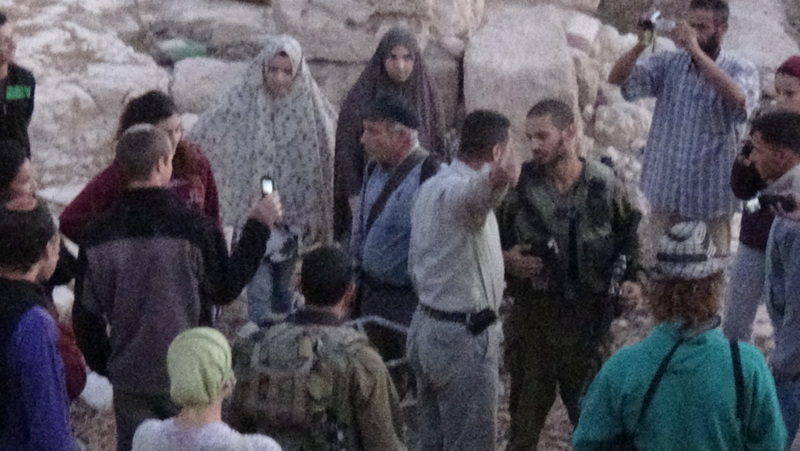 After the villagers nonviolent pressure on the Israelis both settlers and soldiers, they left the village at 6:15 a.m. This is just the last of several ongoing provocations carried out by the Israeli army and settlers to which the South Hebron Hills palestinian communities keep reacting in a nonviolent way. 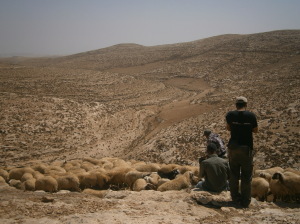 In 2011, in At Tuwani were conducted excavations by Israeli archaeologists escorted by the army. Several archeologist that came to visit the village affirmed that the evidences are dating from the Byzantine period. Yet in December 2011 during an archeology meeting placed in the Israeli settlement of Suseya (in the South Hebron Hills area) was declared that the ruins are part of an ancient synagogue. In the meeting was also explained how to reach the site. The finding of ancient jewish ruins in the ’80s was the formal pretext to forcibly evict the Palestinian population of Susiya village. At Tuwani – Il 17 Settembre, alle ore 5:30, tre macchine con quattordici coloni Israeliani sono arrivate nel villaggio Palestinese di At Tuwani, scortate da due jeep dell’esercito. I coloni sono entrati nel sito archeologico situato tra le case di alcuni palestinesi, nel centro del villaggio, uno di questi era armato. Gli abitanti di At Tuwani si sono riuniti presso la casa palestinese più vicina e il proprietario della casa ha chiesto spiegazioni all’esercito Israeliano riguardo a quello che stava accadendo. Dopo la pressione nonviolenta esercitata dagli abitanti del villaggio sull’esercito e sui coloni, questi se ne sono andati alle 6:15. Questa è l’ennesima delle continue provocazioni compiute dall’esercito e dai coloni israeliani, alla quale le comunità Palestinesi delle colline a sud di Hebron continuano a reagire in maniera nonviolenta. Nel 2011 ad At Tuwani sono stati condotti scavi da parte di archeologi israeliani scortati dall’esercito. Molti degli archeologi che hanno visitato il villaggio affermano che i ritrovamenti risalgono all’epoca Bizantina. Eppure nel Dicembre 2011, durante una conferenza sull’archeologia avvenuta nell’insediamento Israeliano di Suseya (nell’area delle colline a sud di Hebron), è stato dichiarato che le rovine sono appartenenti ad una antica sinagoga. Nella conferenza è stato anche indicato come raggiungere il sito archeologico. Il ritrovamento di antiche rovine ebraiche negli anno ’80 è stato il pretesto formale per l’evacuazione forzata della popolazione palestinese dal villaggio di Susiya. On September 16, a car ran over totally 8 sheep belonging to two Palestinian shepherds from Qawawis village. 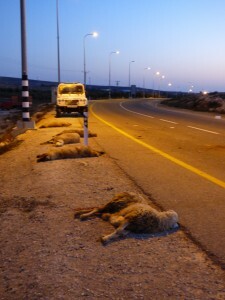 Six sheep died and two were injured. The incident occurred along the Bypass road 317, which connect eight Israeli settlements and outpost. The two Palestinian shepherds complained to the Israeli police, that came on the place in order to take evidence. Il 16 settembre una macchina ha investito 8 pecore appartenenti a due pastori palestinesi del villaggio di Qawawis. Sei pecore sono morte e due sono state ferite. L’incidente è avvenuto lungo la Bypass road 317, che connette otto colonie e insediamenti israeliani. I due pastori palestinesi hanno fatto denuncia alla polizia israeliana. At Tuwani – On September 14, two Israeli settlers attacked a Palestinian shepherd and two international near the Israeli outpost of Mitzpe Yair, South Hebron hills area. During the aggression the settlers stole from the internationals their videocameras and broke one of their phone. 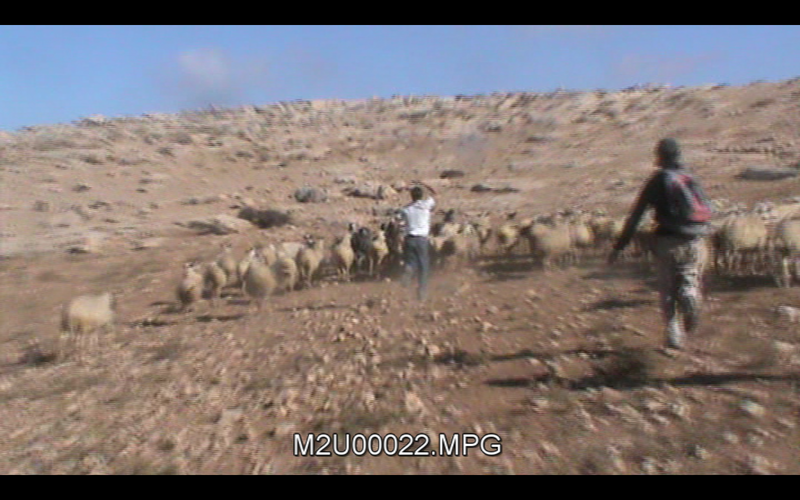 Israeli police detained the Palestinian shepherd and one of the internationals for 6 hours. There were no consequences for the settlers. At about 9:00 a.m. four Palestinian shepherd from the South Hebron hills village of Qawawis were grazing their flocks accompanied by two internationals, on Palestinian owned land nearby the Israeli outpost. 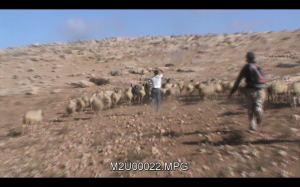 Two settlers from Mitzpe Yair crossed a closed area (where the access is forbidden to everyone) in order to attack one palestinian shepherd, starting to chase away his flock. The two internationals present taped the scene. Afterwards the settlers assaulted the internationals: at first they grabbed by the neck one international and knocked him down, they snatched his camera and broke his phone; subsequently the settlers attacked the other one twisting her arm and seized also her camera. When the settlers run back to the outpost holding the stolen cameras, the Palestinian and the internationals went to Qawawis village. The Israeli police came to the Palestinian village and asked to the shepherd and to the international that was attacked to follow them to the Israeli Police station in Kiryat Arba settlement, due to one settler claiming that they threw stones against him. The Police officers detained both of them for 6 hours and questioned them about the incident. Israeli police released them at 5:00 p.m. without consequences. The South Hebron hills area suffered the Israeli settlers’ presence since the 70’s. Eight Israeli settlements and outposts (among which Mitzpe Yair) almost isolate 16 Palestinian villages from the rest of West Bank. The settlers’ violence includes also overt violent attacks on Palestinians and their animals, damages of private properties, limitations to freedom of movement with consequences on their daily life. Since the beginning of 2014 Operation Dove registered the arrests of 15 Palestinians, included minors, because they were on lands near the settlements. During the same period there were no consequences for Israeli settlers involved in the incidents occurred in the area. In spite of the violence suffered by the Palestinians from the South Hebron Hills area, they are keeping on grazing and farming on their lands resisting in a nonviolent way the Israeli occupation. Khirbet ar Rahwa – On 1st of September 2014, during the afternoon, the Israeli army and the D.C.O. (District Coordination Office) entered into the palestinian village of Khirbet ar-Rahwa, in the South Hebron Hills, and demolished 3 houses (tents), 3 animal shelters and 3 toilettes. No demolition order was delivered for these structures. All the demolished structures were built with simple materials. Ar-Rawha that is located in area C, has no access to electricity, to the water pipeline and to any kind of facilities and services. The houses belonged to the Altal family and to the Jabaarin family. Because of the demolitions, 38 persons, 21 of them children, lost their houses. All the families are waiting for humanitarian aid. The village of ar-Rahwa is surrounded by the settlement of Tene and the outpost of Havat Moor. This outpost received demolition order in 2000, but the D.C.O decided to not demolish any house until now. Also the outpost is connected with the electricity net and water pipelines, services that are denied for the Palestinians of ar-Rawha, who are the legal owners of the land where the settlement of Tene is located. Khirbet ar-Rahwa – Nel pomeriggio del 1 settembre 2014, l’esercito israeliano e la D.C.O. (Dicstrict Coordination Offeice) è entrato nel villaggio palestinese di Khirbet ar-Rahwa , situato nelle colline a sud di Hebron, e ha demolito 3 strutture abitative, 3 ricoveri per le pecore, e 3 servizi igienici. Nessun ordine di demolizione è stato consegnato agli abitanti del villaggio proprietari delle strutture. Tutte le strutture demolite erano costruite con materiali semplici ferro, lamiera, tende. Il villaggio di ar-Rahwa che è situato in area C, non ha accesso alla rete elettrica, nè idrica, nè può accedere a nessuno dei servizi di base. Le strutture appartenevano alle famiglie Altal e Jabreen. A causa della demolizione hanno perso la casa un totale 38 persone, di cui 21 bambini. Le famiglie colpite stanno ora aspettando aiuti umanitari. Il villaggio di ar-Rahwa è circondato dalla colonia di Tene e dall’avamposto di Havat Moor. Questo avamposto ha ricevuto l’ordine di demolizione nel 2000, tuttavia la D.C.O. non ha mai deciso di rendere effettivo l’ordine o di demolire qualche struttura. Inoltre l’avamposto è connesso alla rete elettrica e idrica , servizi negati ai palestinesi del villaggio di Ar Rahwa, che tra l’altro sono i legali proprietari della terra su cui sorge la vicina colonia di Tene. In civilian life, anyone suspected of manslaughter or murder is immediately arrested, with an investigation coming later. In the IDF the opposite is true. Khalil Anati was from the Al-Fawar refugee camp in the southern part of the West Bank; a soldier in an armored jeep shot him in the back with a live round and killed him as he was running home. He was 10 years old. Mohammed Al-Qatari was a promising soccer player from the Al-Amari refugee camp near Ramallah. A soldier shot him from a distance of several dozen meters while he was taking part in a demonstration against the Gaza war. He was 19 years old when he died. Hashem Abu Maria was a social worker from Beit Ummar who worked for the Geneva-based NGO Defense for Children International. He participated in a demonstration against the Gaza war, trying to protect children by preventing them from throwing stones. An IDF sharpshooter situated on a distant balcony shot and killed him. He was 45 years old, a father of three children. Soldiers killed two more demonstrators at that demonstration. These people were among many others killed by IDF fire far from the battlefields of Gaza. According to data provided by the United Nations Office for Coordinating Humanitarian Affairs, the IDF killed 20 adults and three children in the West Bank during the fighting in Gaza. Soldiers also wounded 2,218 people, 38% of them by live fire, a particularly high number in comparison to 14% in the first half of 2014 and 4% in 2013. None of those killed were endangering soldiers’ lives, none of them were armed or deserved to die. The fighting in Gaza loosened all restraint. Under its umbrella soldiers permitted themselves to use live fire in order to disperse demonstrations, settle scores with people throwing stones or Molotov cocktails – including children – and punish anyone demonstrating against the war. Perhaps these soldiers were envious of their comrades fighting in Gaza, perhaps they were frustrated at being far from the real action – in any event they were confident that no harm would befall them, not while in Gaza there was almost a massacre taking place, with the nation’s heart going out to its fighting men. No one stopped them, no one was arrested or prosecuted. “The Military Police is investigating” has become code for the IDF spokesman in his automatic responses, a code which blurs and conceals, until the files gather dust and are forgotten. In civilian life, anyone suspected of manslaughter or murder is immediately arrested, with an investigation coming later. In the IDF the opposite is true. First comes an investigation, usually leading nowhere, even when the circumstances are straightforward. There is no question of arresting anyone, even when the incident cries out to the heavens, as in the case of the shooting at Al-Fawar. The soldier who killed the boy is apparently continuing with his life as usual. These are routine practices associated with the occupation. There is no comparison to the numbers in Gaza, but this routine exposes the true face of the IDF, the way it regularly conducts itself with regard to Palestinians, and especially its persistent disregard for their lives and deaths. There was no war being waged on the West Bank – soldiers were not facing battalions of Izz-ad-Din al-Qassam fighters, nor were they up against attack tunnels, rockets, sharpshooters or explosive devices. Yet see how they killed and maimed, using live fire against demonstrating youths and even children; how they cut short the life of a soccer player who a few weeks earlier had been promised a brilliant career by Sepp Blatter, the president of FIFA; or the lives of a 10-year-old refugee boy and a social worker innocent of any crime. The crimes committed in the West Bank will not be investigated by any international tribunal – there is no need to prepare excuses, write reports or enlist lawyers. But it is precisely these smaller incidents – after all, what are 20 deaths in contrast to the hundredfold larger numbers in Gaza? – that should worry us. There was no war here, hardly any acts of terror, only angry demonstrations by those who were understandably driven to distraction by the fate of their brethren in Gaza. Note how they were treated by IDF soldiers. This is the behavior of the nation’s army, its soldiers now lauded by all. One can respect and cherish the people’s love for its soldiers, but one should remember what these soldiers do as part of their routine military service, day in, day out, year after year. Articolo di Gideon Levy, apparso su Haaretz, 30 agosto 2014. Khalil Anati era del campo profughi di Al-Fawar nella parte meridionale della Cisgiordania; un soldato da una jeep blindata gli ha sparato alla schiena con il fuoco vivo e lo ha ucciso mentre stava correndo a casa. Aveva 10 anni. Mohammed Al-Qatar era un calciatore promettente dal campo profughi di Al-Amari vicino a Ramallah. Un soldato gli ha sparato da una distanza di alcune decine di metri, mentre stava prendendo parte ad una manifestazione contro la guerra a Gaza. Aveva 19 anni quando è morto. Hashem Abu Maria era un assistente sociale di Beit Ummar che lavorava per la ONG con sede a Ginevra Defense for Children International. Partecipava a una manifestazione contro la guerra a Gaza, cercando di proteggere i bambini, impedendo loro di lanciare pietre. Un tiratore scelto IDF, situato su un balcone lontano, ha sparato e lo ha ucciso. Aveva 45 anni, era padre di tre figli. I soldati hanno ucciso altri due manifestanti in quella manifestazione. Queste persone, come molte altre , erano lontano dai campi di battaglia di Gaza. Secondo i dati forniti dall’ Ufficio per il coordinamento degli affari umanitari delle Nazioni Unite, l’IDF ha ucciso 20 adulti e tre bambini in Cisgiordania durante i combattimenti a Gaza. I soldati hanno anche ferito 2.218 persone, il 38% dei quali con il fuoco vivo, un numero particolarmente elevato in confronto al 14% del primo semestre del 2014 e del 4% nel 2013. Nessuno di coloro che è stato ucciso metteva in pericolo le vite dei soldati, nessuno di loro era armato o meritava di morire. I combattimenti a Gaza hanno allentato ogni freno. Sotto il loro ombrello i soldati permettono a se stessi di usare il fuoco vivo per disperdere le manifestazioni, regolare i conti con la gente che lancia pietre e bottiglie molotov – bambini compresi – e punire chiunque dimostri contro la guerra. Forse questi soldati erano invidiosi dei loro compagni che combattevano a Gaza, forse erano frustrati per essere lontani dall’azione reale ,in ogni caso erano sicuri che nessun male li avrebbe colpiti, non mentre a Gaza c’era pressochè un massacro in atto, con il cuore della nazione che moriva per i suoi combattenti. Nessuno li ha fermati, nessuno è stato arrestato o processato. “La polizia militare sta indagando” è diventato un codice per il portavoce dell’IDF nelle sue risposte automatiche, un codice che confonde e nasconde fino a quando i file raccolgono la polvere e sono dimenticati. Nella vita civile chiunque sia sospettato di omicidio colposo o omicidio viene immediatamente arrestato con un’indagine successiva . Nell’ IDF è vero il contrario: un’indagine di solito non porta da nessuna parte, anche quando le circostanze sono semplici. Non si tratta di arrestare chiunque, anche quando l’incidente grida al cielo, come nel caso della sparatoria ad Al-Fawar. Il soldato che ha ucciso il ragazzo apparentemente continua con la sua vita, come al solito. Si tratta di pratiche di routine connesse con l’occupazione. Non c’è confronto con i numeri a Gaza, ma questa routine espone il vero volto della IDF, il modo usuale di agire conduce per quanto riguarda i palestinesi, e soprattutto il suo disprezzo persistente per la loro vita e la loro morte. Non c’era una guerra condotta in Cisgiordania ,i soldati non stavano affrontando battaglioni di combattenti di Izz-ad-Din al-Qassam, né erano contro i tunnel di attacco,contro i razzi,i tiratori scelti o dispositivi esplosivi,ma si guardi come hanno ucciso e mutilato usando il fuoco vivo contro i dimostranti giovani e persino i bambini; come hanno spezzato la vita di un calciatore al quale ,qualche settimana prima, era stata promessa una brillante carriera da Sepp Blatter, presidente della FIFA; o la vita di un ragazzo di 10 anni e di un assistente sociale innocente.. I crimini commessi in Cisgiordania non saranno oggetto di indagine da un qualsiasi tribunale internazionale, non c’è bisogno di preparare scuse, scrivere relazioni o arruolare avvocati.,ma sono proprio questi incidenti minori – dopo tutto, che cosa sono 20 morti in contrasto con il centuplo dei numeri più grandi a Gaza? – che dovrebbero preoccuparci. Non c’era nessuna guerra qui, quasi nesuun atto di terrorismo, solo dimostrazioni di rabbia da parte di coloro che sono stati comprensibilmente spinti a protestare per la sorte dei loro fratelli a Gaza. Si noti come sono stati trattati dai soldati dell’IDF.Questo è il comportamento dell’esercito della nazione, dei suoi soldati ormai lodati da tutti. Si può rispettare e amare l’amore del popolo per i suoi soldati, ma bisogna ricordare ciò che questi soldati fanno come parte del loro servizio militare di routine, giorno dopo giorno, anno dopo anno.